Haitian vetiver oil is light to dark brown, amber viscous oil evoking earthy, woody and deep smoky odor with a persistent sweet undertone. Haitian vetiver oil is extracted from vetiver grass, which is a perennial bunchy herbaceous grass and has extensive fibrous root. The roots of vetiver grass are enriched with fragrant essential oil, which is extensively used in perfumes, aromatherapy, cosmetics, and food and flavoring industries. Haitian vetiver oil contributes the major share in national income of Haiti Island. Haitian vetiver oil is available in food grade and industrial grade, in which food grade Haitian vetiver oil is used in food and beverage industry as a food additive. Industrial grade Haitian vetiver oil is extensively used in perfumes and cosmetic industry owing to its multiple skin benefits such as moisturization, protection and astringent properties with a lovely aroma. The properties of Haitian vetiver oil makes them one of the good choices for the cosmetic manufactures to use it in anti-aging creams, where it provides deep moisturization to the skin. 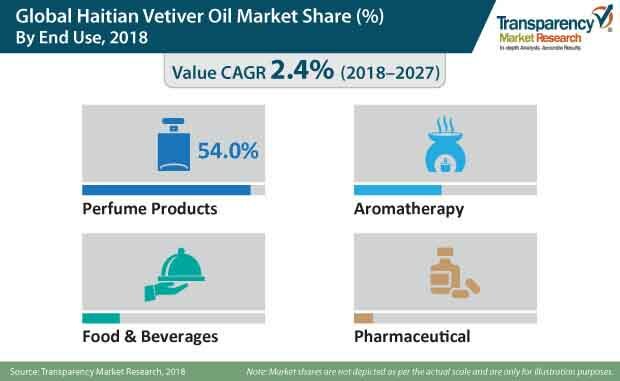 In the global perfumes market, Haitian vetiver oil is becoming popular owing to its multiple skin benefits and rising demand in aromatherapy. In the global Haitian vetiver oil market, it is extensively used for blending of the oriental type of perfumes and floral compounds, as well as it is also used in other cosmetics. In the global perfumes market, Haitian vetiver oil used as the main ingredient in 20% of all men fragrances and used in 36% of western quality perfumes. On the other hand, increasing demand for vibrant flavors and aroma in the food products is also propelling the demand for Haitian vetiver oil as food additives. In the global Haitian vetiver oil market, Haiti holds the major share in the production of global vetiver oil. India, U.S., Europe, Japan are the major consumers of Haitian vetiver oil in the global Haiti vetiver oil market. With the increasing demand of Haiti vetiver oil among consumers, it can be anticipated that the demand for Haiti vetiver oil will grow over the forecast period. As much beneficial Haitian vetiver oil is for health, it can have medicinal and therapeutic effects on the skin as well as on nervous system. As Haitian vetiver oil can be helpful in treating various skin or nerve disorders, it is used in various skin treatments and beauty products. Getting rid of pimples and acne, reducing blemishes, treating dry skin problems, etc., are some of the skin-related issues that can be cured with the help of Haitian vetiver oil. In addition, Haitian vetiver oil is a rich source of antioxidants, which is found to be helpful in anti-aging of the skin. An increasing number of health-conscious consumers across the globe is encouraging manufacturers to supply products with organic and natural ingredients like Haitian vetiver oil, as consumers are preferring natural products instead of chemical products when it comes to buying beauty products. Use of Haitian vetiver oil in most of the beauty treatments is one of the most popular trends followed by the majority of the manufacturers in the global Haitian vetiver oil market. Mass production and economies of scale have enabled fragrance companies in keeping operational costs low; however, consumers today prefer personalization and customization. Perfumes that are personalized & customized have a higher chance of hitting the right note among consumers even in the absence of mammoth marketing budgets. In order to cater to the demand of earthy fragrance and aromatic fir, manufacturers are considering Haitian vetiver oil for use in their final products. Higher engagement of customers, coupled with their patience with regards to product delivery, is encouraging manufacturers to instate a separate unit for considering customer needs. The product customization is also scaling up perfume sales. Customers are always seeking novel treatment options to reduce the signs of aging. The expectation of customers from treatment usually tends to be multipurpose, necessitating demand for treatments to address multiple concerns. Aesthetic practitioners across the globe are adopting novel methods of improving skin quality and preventing skin damage. Haitian vetiver oil has various health benefits such as it is found to be helpful in skin health, cognitive health, and stress-related diseases. Haitian vetiver is excellent in treatment such as nervous tension, depression, debility, and insomnia. In addition, Haitian vetiver oil is also acting as an aphrodisiac, which has a direct connection between alleviating stress related problems. Owing to many health benefits, perfume and cosmetic manufacturers are using Haitian vetiver oil in their products to cater to the demand of increasing health consciousness population.